I learned a long time ago that staying busy, running from task to task, always putting out fires is stressful and causes high blood pressure. And as an entrepreneur, what I learned is that it keeps me away from that all important still quiet time where I can receive new ideas, creativity and inspiration. When I balance the inner and outer work, life goes easier and work goes more smoothly. Often, when I’m sitting quiet, one of my former clients will come to mind and I feel moved to pick up the phone and call them. Nine times out ten, the response is “I can’t believe you called, I was just listening to the recording of the life purpose session you gave me!” Or “I was needing to talk to you today, I’m needing a healing!” I love it! It’s my way of working smarter not harder. We are not machines built for perpetual motion. Eventually we will break down, burn out our adrenals or get sick. We are spirits and our spirit needs quiet time. Inspirational time. Play time. Time in our garden, walks in the woods, yoga or meditation. How else can we hear that ‘still small voice’ that knows all, and that will guide us to our clients, our service and our soul’s purpose! I invite you (and remind myself!) to find a place in your daily lives where you can open our soul, expand, breathe deeply and receive that deep peace inside. Maybe it’s time in nature that feeds your soul – beach, woods, the garden, the pool? Or maybe it’s a meditation practice, or yoga or sports. The key is balance. Balance between busy time and play time, quiet time and talking time. Which are you? All work – no play? All play – no work? Too busy to sit quiet? Running from yourself? Avoiding life’s challenges or too engaged in yours and everyone else’s challenges? If you want to know and live your true soul’s purpose I’ve found it takes quiet reflection, inspiration, spiritual practices that help you open your soul and remember. Ahhh feel the peace, the safety, the rest and relaxation! 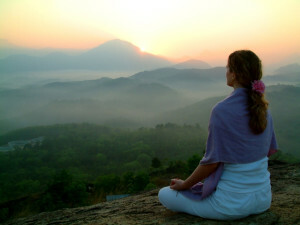 From this peaceful place all is right with the world, you are re-energized and you will be guided rightly! Prev:Living the Dream; Feeling Grateful!